﻿ Simple Self Storage is an independent business catered for a personal service in Wigston, Leicester. Simple Self Storage is an independent family business catered for a personal service in Wigston Leicestershire offering a simple self storage solution for anybody with a friendly service. 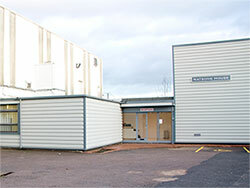 Our commitment is to provide our customers clean safe and secure storage solutions. Our state of the art facility provides individually alarmed units, Electronic access control system, digitally recorded CCTV cameras. Intruder alarms, energy saving lighting and smoke detectors are fitted throughout the storage area to provide a safer environment for your valued belongings. Self Storage is the solution for domestic or business customers. You hire your own clean, dry, private, self-contained storage room, and lock it with your own padlock. We have a range of padlocks available in store. We offer state of the art 24 hour security including a personal access code system which allows you into our buildings . The system ensures that you have total control over who enters your storage room. You can also allow multi users to enter in the unit. You control the access. All our storage units are Indoor and gives you immediate "walk-in" access to your storage room without any additional charges, unlimited access during opening hours. Ample parking is available. Our storage spaces are divided into units from 8 sq. ft. to 250 sq. ft. so that you only pay for the space you need. You can move things in or out of your unit as frequently as you like during opening hours. You can simply store practically anything, almost regardless of size, from filing cabinets to golf clubs, Christmas decorations to computers, beds to bicycles, granny's china to garden furniture - as long as it's not flammable, perishable or illegal. Storing couldn't be easier for domestic or business customers. Plaese feel free to contact us if you have any questions.